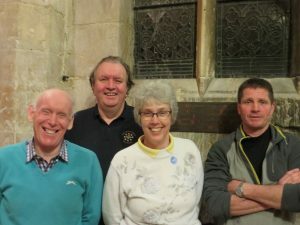 A team of belll ringers from Cheltenham Minster has again entered the Swimarathon. Organised by Cleeve Hill 41 Club, the event takes place on Saturday 8th April 2017 at Cheltenham College Pool. Teams keep 80% of the sponsorship they raise for their own use – 41 Club uses the rest to cover expenses with any remaining to assist local causes. Last year the team won two trophies, one for the Most Sponsorship for a Senior Team, and one for the Most Sponsorship for a New Team. This year’s team comprises Isabel Hitchings, Reg Hitchings, Chris Hickey, Paul Staines, Charles Beardsell and Mark Davies. If you wish to donate please click here.